In this image made off a video released by Miyagi Prefectural Police, water rush up Sunaoshi river in Tagajo, Miyagi prefecture, Nov. 22, 2016. A powerful earthquake off the northeast Japanese shore Tuesday sent residents fleeing to higher ground. That’s how one school girl from a Pacific Island nation described a tsunami. On Dec. 26, 2004, a magnitude-9.1 earthquake in Indonesia set off a massive tsunami which killed more than 230,000 people across four countries and cost an estimated $10 billion in damage. Nov. 5 is World Tsunami Awareness Day and at the United Nations Wednesday, disaster risk reduction was high on the agenda. 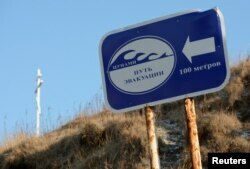 “What I can tell you is that the tsunami wave cannot be stopped,” said Bulgaria’s U.N. Ambassador Georgi Velikov Panayotov, who with his wife was on vacation in Thailand in 2004 and survived the tsunami. “What we can do is build early warning systems and of course, educating the population about the devastating power of the tsunami wave,” he said. On March 11, 2011, a magnitude-9 earthquake rocked northeastern Japan triggering a fierce tsunami that also damaged the Fukushima Daiichi nuclear plant, south of Sendai. It was the most powerful quake ever recorded in Japan, killing more than 15,000 people and causing widespread damage and destruction. “When the big earthquake hit Japan in 2011, people thought that we were prepared for it,” said Japan's U.N. Ambassador Koro Bessho. “We had embankments, we had drills, however, we had been counting on something the size of which that hits every 100 years and the earthquake was of the size of possibly every 500 years or thousand years,” he said. These two events sent the countries of the region into overdrive to review and improve disaster preparedness. In 2015 the Sendai Framework for Disaster Risk Reduction was born. It aims to help create a better understanding of disaster risk and enhance preparedness for an effective response. A direction sign reading "Tsunami. Evacuation route. 100 meters" is pictured in front of a cross in the village of Malokurilskoye on the island of Shikotan, Russia, Dec. 18, 2016. Individual countries also assessed their preparedness and planning. Indonesia is an archipelago made up of thousands of islands which are disaster-prone. Rampangilei noted that 150 million Indonesians live in danger of earthquakes, 60 million from floods, and four million at risk from tsunamis. He said his government now has contingency plans for every disaster-prone city which identifies its vulnerabilities, outlines the relief response, and builds overall preparedness. The Maldives are another Indian Ocean chain of more than one thousand small islands, of which about 188 are inhabited. Banda Aceh, Indonesia, where the quake struck, is about 700 kilometers from the Maldives. “Three hours after the earthquake hit, the tsunami hit the Maldives and put the entire country under water for a few minutes," Mohamed said. "About 10 percent of the islands were hit." The death toll was comparatively low 127 fatalities. But the damage was estimated at about 60 percent of the Maldives Gross Domestic Product and the country's mainstay its tourism industry took a nosedive. 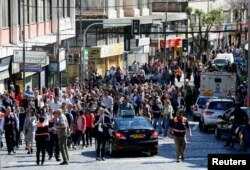 Citizens take part in a mass evacuation during a simulated disaster by a fictitious tsunami to mark World Tsunami Day on the Pacific coast in Valparaiso, Chile Nov. 3, 2016. In the aftermath of the 2004 tsunami, the region put in place a Tsunami Warning System. It provides alerts through three regional watch centers in India, Indonesia and Australia, and a network of 26 national tsunami information centers. In 2012, Banda Aceh again experienced an earthquake, but within eight minutes of it, early warnings were emitted across the region and no casualties were reported. There are also now tsunami early warning systems in place for the Caribbean and the Northeast Atlantic, Mediterranean and connecting seas. This week, UNESCO is helping coordinate a drill of the early warning system throughout 15 countries in the northeast Atlantic and Mediterranean. The agency hopes to evaluate local tsunami response plans, increase tsunami awareness and improve regional coordination. 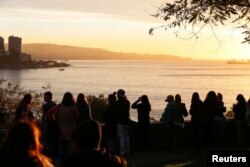 People look out towards the ocean on Cerro Castillo hill, after a mass evacuation of the entire coastline during a tsunami alert after a magnitude 7.1 earthquake hit off the coast in Vina del Mar, Chile April 24, 2017. At risk countries are also expanding their education programs, specifically targeting children from an early age so they know how to react in case of a tsunami. Children are taught to shelter in place till the earthquake passes and then go with their classmates to higher ground away from coastal areas to avoid the walls of water the tsunami triggers. Japan is sharing its expertise, assisting with joint evacuation drills in schools in 18 countries. It is also hosting next week a summit of high school students from 25 mainly island nations next aimed at improving their understanding on tsunami risks and on life-saving measures during such events. 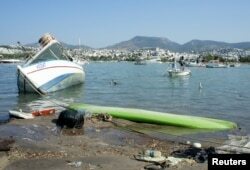 Damaged boats are seen after an earthquake and a tsunami in the resort town of Gumbet in Mugla province, Turkey, July 21, 2017. Countries which have experienced earthquakes and tsunamis have also learned that better building codes can save lives and prevent damage. Chile, which is one of South America's most earthquake and tsunami-prone nations, has seen the difference tougher building codes and other measures can make. In February 2010, the country experienced an 8.8-magnitude quake and a devastating tsunami that killed some 525 people. Four years later, an 8.4-magnitude earthquake struck. Fifteen people were killed in the quake, but no one in the tsunami that followed. “Building codes were strengthened,” said Chilean diplomat Jorge Iglesias Mori of the measures taken between 2010 and 2014. He said the country also put more resources into developing their early warning systems and expanding their disaster education programs and drills, and they joined forces with Japan, sharing knowledge and experiences.